YouTuber jmhrvy1947, has recently uploaded a number of videos giving an overview of how he built his own HF SDR transceiver using what he calls the “Lego build method”. The idea of the Lego build method was to build a transceiver with parts picked and pulled from eBay so that it could be easily reproduced by others. There are a few scratch made components however those designs are available on his GitHub page. The SDR only functions within about 100 kHz of spectrum at a time however for amateur radio HF work this is more than sufficient. Bare bones the radio puts out a mere 100 mW and although the output power is small, he’s made contacts up to 450 miles away using CW (Morse code). You also have the option of adding an amplifier on your output if you are looking for more power than that. His final revision currently puts out 100 Watts. Using modified versions of fldigi and Quisk he is able to easily work various digital modes and sync the transmitter and receiver together. The only real down side to this radio is that you must switch out your receive and transmit filters whenever you wish to operate on different bands, a process that really only takes a moment or two. Check out his videos on the project – it’s really amazing to see what can be done with a small budget these days in radio and with how far software defined concepts have brought us. In the video below you’ll see an explanation of the software involved in this build. 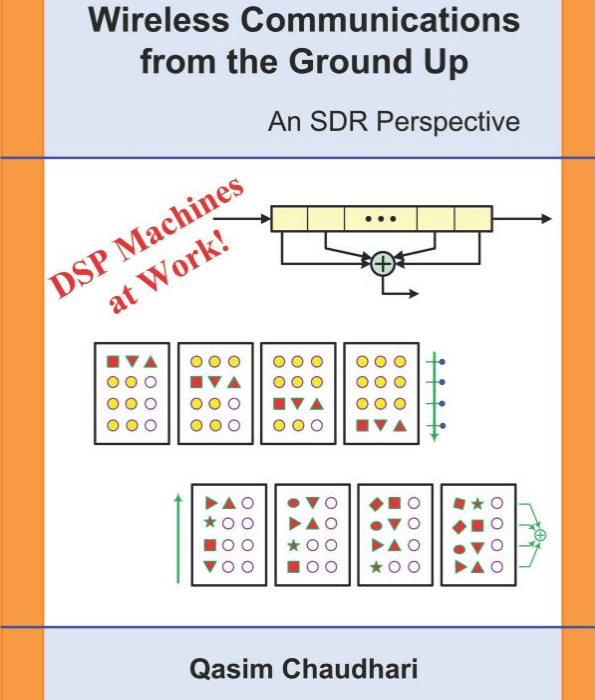 Thanks to author Qasim Chaudhari for writing in and sharing with us that his new book titled "Wireless Communications From the Ground Up - An SDR Perspective" has been released. Qasim is a research fellow in the Electronic and Telecommunications Engineering department at RMIT University in Australia and has been giving presentations and talks each month at Cyberspectrum Melbourne for more than 3 years. There are different angles from which this book contributes to the understanding of wireless communication systems from the perspective of a Software Defined Radio (SDR). In my opinion, any language, including that of mathematics, is an unnatural mode of communication. For example, I can write the words darwaza, porte, puerta, umnyango, ovi and only certain people will understand what I mean. However, if I show you an image of a door, almost every single person on the planet will immediately get the concept. A figure imprints a massive amount of parallel information in our brains that is much easier to process and recall later. Since a human mind handles images very well, I try to visualize equations through beautiful figures which you will encounter throughout the text with logical and intuitive explanations. If you are not a pure wireless communications academic, you would have found that the mainstream textbooks on this topic are filled with heavy mathematical details which makes this field an exclusive membership club for those who can understand several types of frequency variables and their corresponding Fourier transforms, probability and random processes and detection and estimation theories. While this is true for becoming a master, the Software Defined Radio (SDR) revolution and subsequent projects like GNU Radio have made it possible for anyone to sit down and construct their own unique radio by writing code. Many even do not need to know most of the above mentioned topics. All they need to understand is why an algorithm does what it does so that they know how to write its code, or modify it in an even better way. For this purpose, I have only relied on school level mathematics to explain all the concepts. You will not find any e or j of complex numbers here, nor will you encounter any integrals, probability theory and detection or estimation theory. The only things to know are a sine, cosine and a summation as well as a derivative (which I have occasionally used). The best books written on implementing digital communication systems using Digital Signal Processing (DSP) algorithms are by fred harris (Multirate signal processing for communication systems) and Michael Rice (Digital communications – A discrete-time approach). As often happens with the grandmasters, they walk on a trail without exactly clarifying it for others. After reading their books, I started to feel that fred harris has mainly focused on `how' of communication systems in an unprecedented detail while Michael Rice has mainly covered `what' of communication systems in his simple and beautiful style. In this process, there were many `why' generated in my mind for which I had to find satisfactory answers. This book is a collection of those simple answers. An extra little bonus is a one page summary of the crux of Rx algorithms, clarifying the role of particular parameters in the signal waveform. Most of the algorithm design can be understood by just grasping the concepts on this one page. A common theme in this text is that some concepts seem easier in time domain and some others are simpler in frequency domain, while their mathematical derivations reinforce the idea. It is fun to grasp a concept covering all three sides. Finally, the book contains a few examples from GNU Radio that explain how to set the parameters in some blocks (e.g., Costas loop, band edge FLL, polyphase clock sync, etc.). The book is currently available on Amazon, and on Amazon you can see a preview of some pages from the book. Qasim also has a website for the book here. This blog is mostly concerned with software defined radios that are affordable to most hobbyists, but if you've ever wondered what the cutting edge is, take a look at the recently released Per Vices Cyan. This is a US$73,500 one channel RX/TX SDR with a tuning range from 100 kHz up to 18 GHz, ADC resolution of up to 16 bits, a maximum instantaneous bandwidth of up to 1 GHz (with 16 GHz if all channels are required), and an on board Stratix 10 FPGA. There are also higher end Cyan's, with the Cyan Mid having 8 RX/TX channels for USD$149,500, and the Cyan Pro with 16 RX/TX channels for USD$289,000. 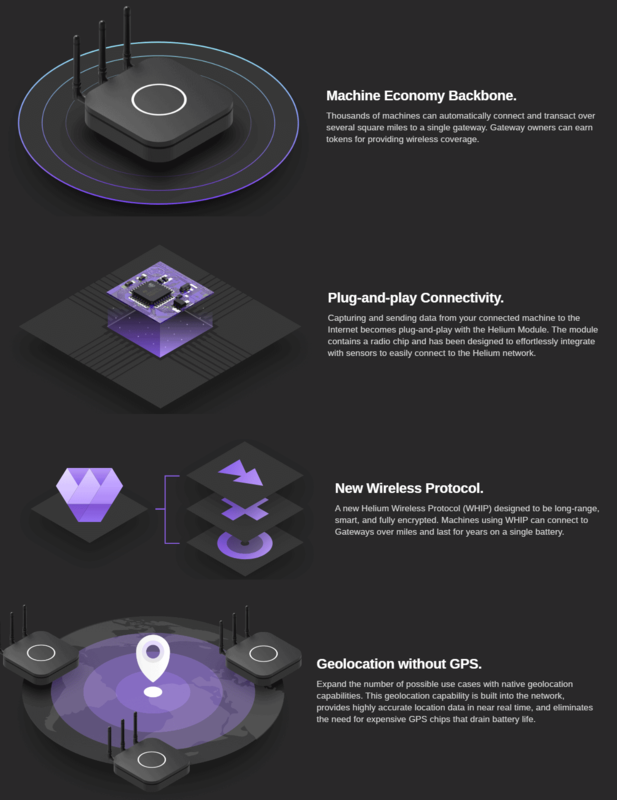 Obviously Cyan is aimed at the research, industrial and possibly military market, but maybe this is the sort of capability we will all have in 10-20 years. Per Vices, an industry leader in wireless platforms in North America, has been developing Software defined radio (SDR) solutions since 2006, offering customers high performance solutions. Continuing to grow their influence in the wireless communications, radar, signals intelligence, defence, medical imaging, and test and measurement markets. Their newest product, Cyan, is the best SDR available on the market, offering the highest bandwidth on a compact radio platform. Cyan continues to fulfill the company’s legacy by providing the market with the highest performance radio solutions. Cyan is designed to offer users with a customizable number of independent, phase coherent radio channels, up to 16 total, each offering a standard 1GHz instantaneous RF bandwidth. Featured on a high channel count, ultra wide band, high gain direct conversion quadrature transceiver and signal processing platform. Cyan provides the highest RF and digital bandwidth with an onboard DSP in a compact form factor. On the digital front, the platform is designed around an Intel Stratix 10 FPGA SoC enabling significant DSP resources for a variety of applications. The platform also features 4 x 40 Gbps digital backhaul enabling ultra-high data throughput while maintaining low latency for applications that require raw radio data to be transferred to another platform. Over on the SWLing Post blog, author Thomas Witherspoon K4SWL has uploaded a new article titled "Software Defined Radio Primer Part 1: Introduction to SDRs and SDR applications". The article originally appeared in the June 2018 issue of The Spectrum Monitor magazine, which can be purchased online for $3 per issue. 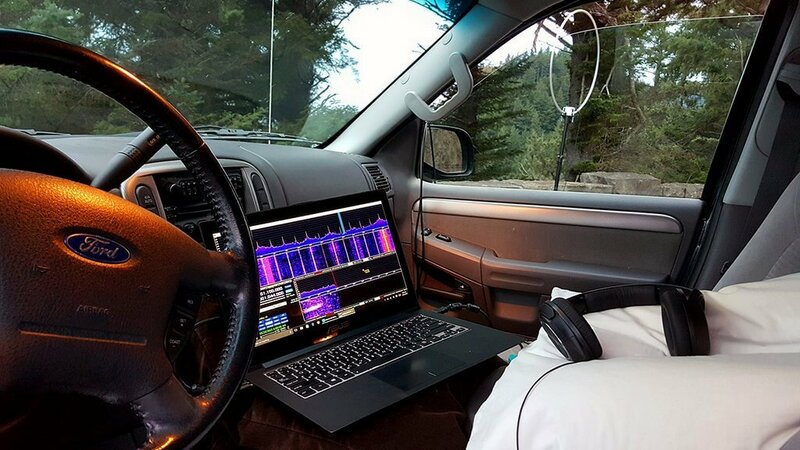 The idea behind the article is to introduce people to SDR from a shortwave listening point of view, so high performance HF SDRs like the Airspy HF+, Elad FDM-S2 and WinRadio Excalibur are discussed. Thomas notes that these SDRs can perform as well as traditional DX-grade receivers that can cost two to three times more. He also explains what advantages SDR's bring to the shortwave radio listening hobby. This may be a good article to show those still using older hardware radios that haven't yet converted to the SDR world. The article is currently part one of a three part series, with parts two and three to be released in October and November. The New England Workshop on Software Defined Radio (NEWSDR) was held in May this year, and there have been several talks now uploaded to YouTube. These are typically fairly technical in nature, and discuss cutting edge research being performed with software defined radios. Below we post a few selected talks, and the rest can be viewed in this WPI playlist. From studies of the ionosphere to astronomical measurements with arrays of radio telescopes the manipulation and analysis of RF signals has been key to new instrumentation and many resulting discoveries. Software radio technology has been a core component of remote sensing of the space environment for several decades now. The flexibility of combining computing and radio was adopted very early on in scientific applications. This enabled new classes of scientific experiments which would otherwise have been impossible. The capability and adaptability of software radio instrumentation and systems has been growing consistently with the exponential increase in available computing power. The recent surge of low cost software radio hardware technology has enabled a new generation of instrumentation. These instruments are increasingly blurring the line between traditionally separate scientific disciplines as well as practical applications. I will discuss the science and the instrumentation enabled by software radio with highlights from studies of the ionosphere and radio astronomy. My overview will focus on the relationship to work underway at MIT Haystack Observatory. I will highlight the core architectural patterns of scientific software radio and discuss the evolution of our systems over several decades of rapid technological change. I will also look forward to the possibilities for discovery offered by the next generation of software radio and radar instrumentation. While wireless communications technology has advanced considerably since its invention in the 1890s, the fundamental design methodology has remained unchanged throughout its history – expert engineers hand-designing radio systems for specific applications. Deep learning enables a new, radically different approach, where systems are learned from wireless channel data. This talk will provide a high-level overview of deep learning applied to wireless communications, discuss the current state of the technology and research, and present a vision for the future of wireless engineering using a data-centric approach. Software defined radios (SDRs) have become the foundational block of agile wireless communications. The first part of the talk presents an overview of how the same SDR can alternate between multiple different and non-traditional actuation functions, such as aerial distributed beamforming and wireless energy transfer. Furthermore, as SDR technology becomes more pervasive assuming roles beyond communication, there is a growing risk of security concerns of ID spoofing and malicious hardware attacks. The second part of this talk describes our efforts of fingerprinting individual SDRs using machine learning, where we only analyze the I/Q samples collected at the receiver. We demonstrate the feasibility of achieving 90-95% classification accuracy through experiments conducted with 12 radios, at separation distances of beyond 50 feet. The talk concludes with a summary of the challenges ahead and identifies other emerging application areas of SDRs that will impact the next decade. Last week we posted about the Artificial Intelligence Radio - Transceiver (AIR-T), which was awaiting release for crowdfunding. Today the Crowd Supply campaign for it has gone live. As expected, the AIR-T is not a cheap with it coming in at US$5,699, and this is with a 10% discount off the MSRP. However, the AIR-T is likely to be more of interest to high end industry and university researchers who have research money to spend. Also, compared to Ettus E310/N310 and LimeNET Mini SDRs which have built in non-GPU based computing platforms and similar SDR performance, the AIR-T could be seen as reasonably priced assuming that the software and drivers for it are decent. In the future we expect to see the price of similar SDR-AI development boards eventually reduce down to hobbyist level prices. 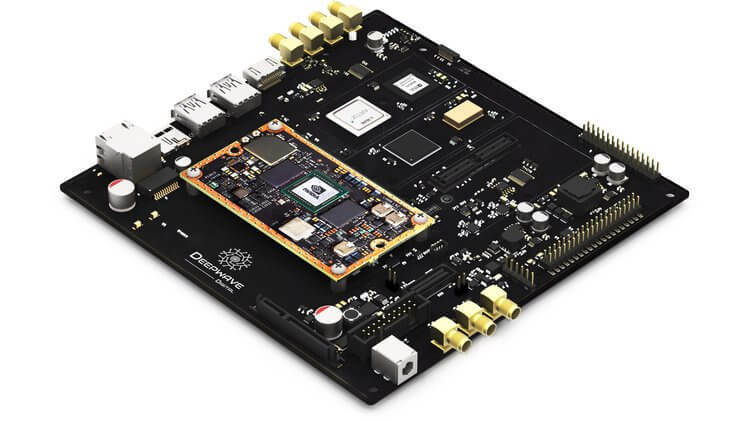 The basic idea behind the AIR-T is to combine a 2x2 MIMO SDR transceiver with a NVIDIA Jetson TX2 GPU that can be used to run artificial intelligence (AI) software fast. They will include software that will allow GNU Radio and Python code to be easily ported to the GPU architecture.